In 2001 âPoetry of Placeâ highly acclaimed architect, Bobby McAlpine, along with local custom builder, Jack Singleton, began the story of âTradewindsâ ~ 607 Beach Bridge Road, Prince George Ocean, Pawleys Island, South Carolina. 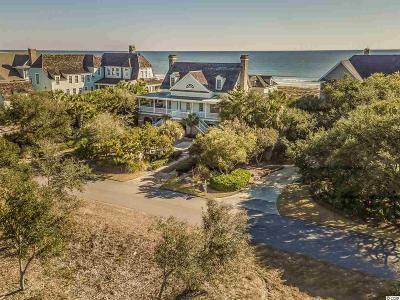 Inspired by the allure of the sea and natural lowcountry setting with views of Middleton Pond this oceanfront beach house is simply stunning, where beauty is in the detail. Gracious wraparound porches, French doors, copper enhancements, shaker roof, salvaged brick, sweeping stairs and highly custom woodwork are just a few of many layered textures and features. Open living areas flanked with two warm fireplaces, heart of pine flooring and shiplap embrace you when you enter. The welcoming continues in the kitchen with soapstone countertops, open shelving, butlerâs pantry and sophisticated appliances, all simply beckoning the call to gather and dine. Simplicity and elegance abound with a gorgeous master bath and lovely retreat setting. In keeping with the call of the sea and desire to embrace the breeze and salt air a separate oceanfront living space is an open palette ~ currently used as a guest house. Entertaining will be a breeze, the ground level features two outdoor fireplaces and is just perfect for oyster roasts or barbecues! Located in Prince George, a private historically significant 1900 acres that stretches from the beautiful Atlantic Ocean to the IntraCoastal Waterway, this rare exclusive community is reserved for residents and their guests who appreciate the pristine location and natural wildlife safe haven. Community amenities include residents river and ocean club houses, pool, tennis court, volleyball and basketball courts, nature paths, lakes, marsh, private ocean access, 28 slip marina, outdoor fireplaces and acres of preserved green space. Seaside Pawleys Island, South Carolina is located just north of historic Charleston and south of the vacation destination Myrtle Beach. Myrtle Beach International Airport is about 30 minutes away. Directions: Enter Into Prince George Ocean, Follow Vanderbilt Boulevard Towards The Clubhouse, Turn Right Onto Beach Bridge, House Will Be On The Left.